Are you the one who prefers to have everything on hand so you do not spend much time in organizing your closet? Do you consider yourself addicted to order? Do you like to take care of aesthetics and decoration, even in the closet? Our character and our lifestyle condition both the decoration and the order of the house. We know and why we have selected some ideas to help you sort the closet given your character and lifestyle. For practical girls, whose frantic pace of life forces them to look for ingenious and functional organization solutions, nothing better than open and visible order? It is appropriate to use solutions that allow us to order all our clothes and accessories close at hand. At least, the items we use most often, since other seasons clothing we should store it in other spaces, preferably away from the bedroom. So optimize to the maximum our wardrobe and dressing area. A good example of open and visible storage are the boxes, transparent covers, closet organizers several compartments, shelves, hangers and shelves. In addition, it can also be interesting to replace the closet for a coat rack or donkey for clothes. Open solutions allow us to see all our garments and accessories at a glance. Therefore, the solutions of order (open and visible) are perfect for the girls who look for a practical organization, for which they have not a second to lose and also for the most disorderly. If you are a lover of order and want your wardrobe to reflect your personality, our advice is that before ordering the wardrobe, you notice the type of garments. 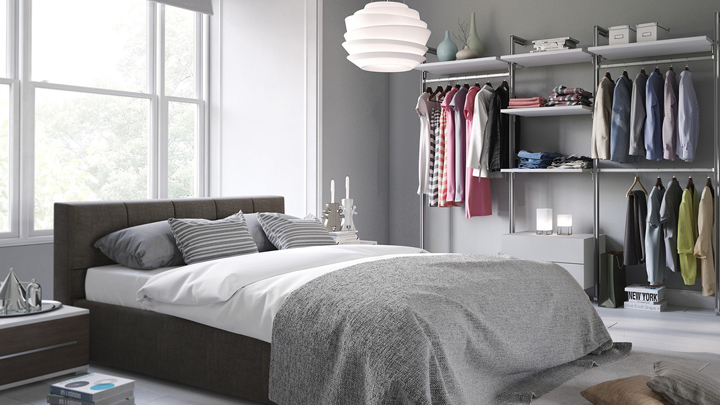 If you have more hanging clothes than folding, you may need more hanging hangers than drawers or shelves in the closet. That is, it plans the order considering the clothes you have. When ordering our closet we can use different systems that allow us to classify our clothes: by category (pants, shirts, skirts, dresses, etc.) or by type of looks and occasions (daily, knitted for office, etc. ). If in addition you order also concerned about the style, our advice is to try to organize the closet by color palette. It is another system that also usually works. It is about classifying clothes by colors and shades. The advantage is that it helps us when combining clothes and also managed a balance in the decoration of the closet. The drawback is that this type of order requires some maintenance and daily care. So it is not suitable for the most cluttered girls. What can we do to those little accessories like scarves, belts …? If you’re sick of losing at the bottom of the drawers, we recommend you choose compartmentalized boxes that can be placed on shelves in a closet or cabinet, as the drawers or dresser. For necklaces, rings, bracelets and other similar accessories, nothing better than vintage busts, such as those used to the old seamstresses. These pieces are very fashionable. The great advantage is that, in addition to practical, they are super decorative. There are different solutions of order to organize the closet. The key is to find the ideas that best fit our personality, our type of clothing and, of course, our space. Although before you start ordering, should do a thorough cleaning. That is, empty the cabinet completely and selected one by one, the clothes and accessories you want to keep. Getting rid of what we do not use or need is the first step to achieving an impeccable and well-organized dressing room.